1 Tbsp. unsalted butter, chilledPreheat oven to 425 degrees. To make crust, sift flour, salt, and sugar into a large mixing bowl. Cut in shortening with pastry blender or fork. Whisk together ice water, egg and vinegar. Sprinkle egg mixture 1 Tbsp. at a time onto flour mixture while fluffing with fork. Cover and chill. To make filling, place reserved juices in a 2 cup measure. Add enough water to make 1 1/2 cups and pour into a medium-size sauce pan. Add cornstarch, sugar and salt. Stir to dissolve. Heat and stir until mixture thickens and turns clear. Add raspberries, cherries, almond extract, orange zest and cinnamon. Stir gently and remove from heat. Divide chilled pastry dough in half. Roll out one half onto slightly floured surface forming a circle large enough to line a 9-inch pie plate. Place rolled dough in pie plate. Pour in filling and dot with butter. Roll out remaining pastry and place over top of pie. Trim excess dough from the rim and crimp the edges all the way around the plate. Bake 35-45 minutes, or until crust is golden brown. TIP: For golden glossy crusts brush surface of dough with a mixture of one egg white and 1 Tbsp. of cold water beaten together. 8 servings. What a marvelous and festive recipe, yes? 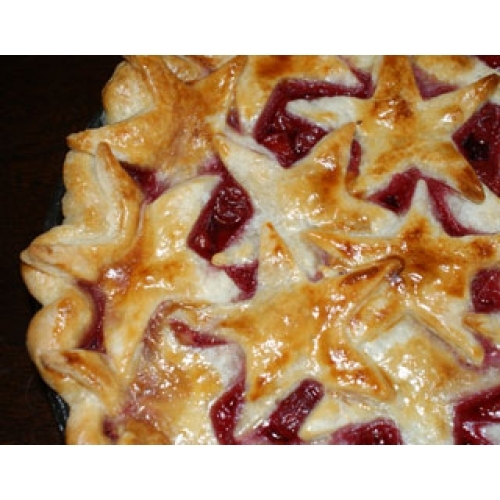 If you want the stars on the crust (like I do for our 4th of July picnic), instead of putting on the top crust, roll out the dough and, using a star shaped cookie cutter, cut the dough in many star shapes. You could even use multiple sizes of stars. Crimp the edge of the pie crust, put in the filling and then carefully arrange the stars randomly, overlapping some, over the top of the pie. Brush the surface with the egg white and water mixture and bake. 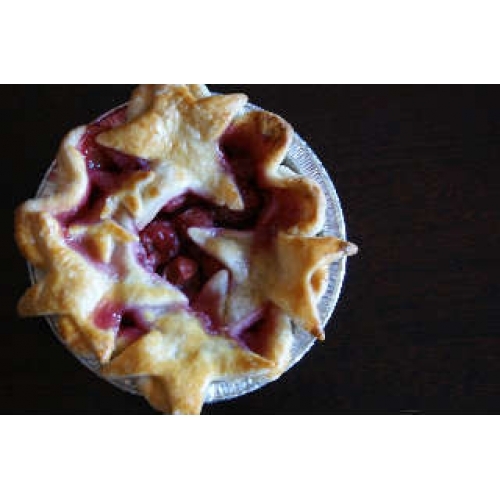 Individual pies are fun, too. You can get miniature pie tins at the grocery store. Look in the baking isle for the foil baking pans. Roll out the dough in several smaller rounds and make them just like the big pies, but with fewer stars. Aren’t they cute?